The first great master of pool was Ralph Greenleaf (left) who sadly died at just 50 years of age. However during his relatively short lifetime he was the 14 to 1 pool champion 19 times. He was also probably the first pool player to take a show on the road performing trick shots and utilising a huge overhead mirror to help spectators get a better view of the play. With this show, Greenleaf toured Vaudeville throughout the 1920s and 30s. His last championship title was in 1937 when he defeated Irving Crane by a score of 125 to minus one. Ralph Greenleaf died suddenly at the age of 50 from an acute internal haemorrhage in the waiting room of a hospital in Philadelphia. He had been ill for several days but had refused to seek medical treatment because of a forthcoming match he was to have played in New York, scheduled several days after he passed. Willie Mosconi (right) is probably the second most famous name in the evolution of pool. 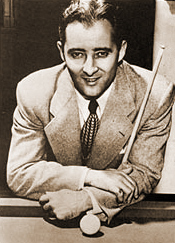 Mosconi was born in Philadelphia in 1913 early on displayed amazing skills with his cue. Greenleaf who saw this child prodigy forecast that Mosconi would eventually become world champion - in fact Mosconi at the age of 20 was invited to tour with Greenleaf and indeed managed to win 50 out of the 170 games they played. Mosconi reached the peak of his talents during the war years and in the next 20 years he set many records. One example of his prowess was that in 1954 in the San Francisco world championship match against Luther Lassiter, Mosconi's best innings during an exhibition match over 2 games produced a run of 526 and lasted three hours.